A rare, expensive possession that is a financial burden to maintain. Something of dubious or limited value. An article, ornament, or household utensil no longer wanted by its owner. An endeavor or venture that proves to be a conspicuous failure. 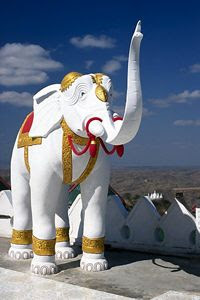 A rare whitish or light-gray form of the Asian elephant, often regarded with special veneration in regions of southeast Asia and India. That being said, after our office White Elephant exchange, I decided I should go into business selling people White Elephant gifts for family and office exchanges, because I never seem to run out of them. And my White Elephant gifts seem to be a hit in an “I can’t believe anyone ever owned one” kind of way. Anyway, happy holidays and let me know if you need any white elephant gifts. But I’m not parting with the mechanical monkey.